Be part of this exciting safari adventure in Tanzania brought to you by Avocet Tanzania Safaris Ltd. They have been operating in Tanzania since 2002 with experienced working staff in tourism sector for more than 26 years. Because of this, rest assured you will experience an extraordinary adventure in the wild. Join and book now! For this safari tour, you will be provided with one-night accommodation at Sunbright Campsite. At 08:00, you will drive from Arusha to Lake Manyara Park and have game drives with picnic lunch boxes. Dinner and overnight will be at Sunbright Campsite. Breakfast, lunch, and dinner will be served to you. After breakfast, you will descend into the Ngorongoro Crater for game drives with picnic lunch boxes. The crater is said to have the densest concentration of wildlife in Africa. As such, Ngorongoro Crater has achieved world renown and attracts a growing number of visitors each year. Even if time is limited, this natural but accessibly small caldera ensures a rewarding safari. Later afternoon, around 15:00, you will drive back to Arusha town, and that is the end of your safari tour. This safari adventure will take place at Lake Manyara National Park and Ngorongoro Crater in Tanzania. Hemingway describes Lake Manyara National Park as a magnificent hunting country in “The Green Hills of Africa”. Mahogany, sausage tree, and croton are alive with blue monkeys and vervets. Elephants feed off fallen fruit while bushbuck, waterbuck, baboons, aardvark, civet, the shy pangolin and leopard, as well as the black rhino, all make their home in the forest. Manyara is a sanctuary to elusive buffalo and hippo, giraffe, impala, zebra and the famous residents, the tree-climbing lions. 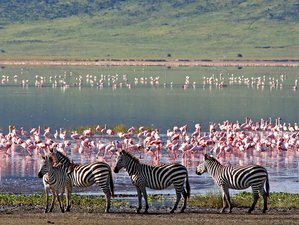 Lake Manyara itself is a magnet for birdlife and a kaleidoscope of different species can be found around its shores, including huge flocks of flamingoes. The park is ideal for a day trip. A four-wheel drive is recommended during the rains. The dry season is from June to September and January to February. The views at the rim of Ngorongoro Crater are sensational. On the crater floor, grassland blends into swamps, lakes, rivers, woodland, and mountains. It is a haven for wildlife, including the densest predator population in Africa. The crater is home to up to 25,000 large mammals, mainly grazers like gazelle, buffalo, eland, hartebeest, and warthog. You will not find giraffe as there is not much to eat at tree level, or topi because the competition with wildebeest is too fierce, nor will you find impala. The crater elephants are strangely, mainly bulls. There are a small number of black rhinos there too. The birdlife is largely seasonal and is also affected by the ratio of soda to fresh water in Lake Magadi on the crater floor. For this safari tour, you will be provided with daily breakfast, lunch, and dinner. All types of food, vegetarian and non-vegetarian, will be served. Avocet Tanzania Safaris Ltd. has been operating since 2002. They offer unforgettable safaris in Tanzania, Uganda, and Kenya, also mountain climbing, and more.